Thursday August 17th 1893 I got up early and sewed some before breakfast. I was busy all forenoon getting things ready and in the afternoon Will got a horse and buggy and we took the silver over home and Will took [Sankie?] over to Woolfs. I then went out after my dress. When I got back Mollie & Laura were here for a little while. I got supper after they left. Then Will and I began to get ready and pack up. We were just ready for the hack when it came. Went by way of Bureau Junction and got to Peoria at six in the morning. a comfortable nights ride. Friday August 18th 1893 arrived at Delavan at half past eight and nearly all the Mason family met us at the depot. I spent the day with Vene and took a little sleep. After supper we walked down town with Joe and Allie Woolf. Will went to see about our valise which did not come. We went to bed early. 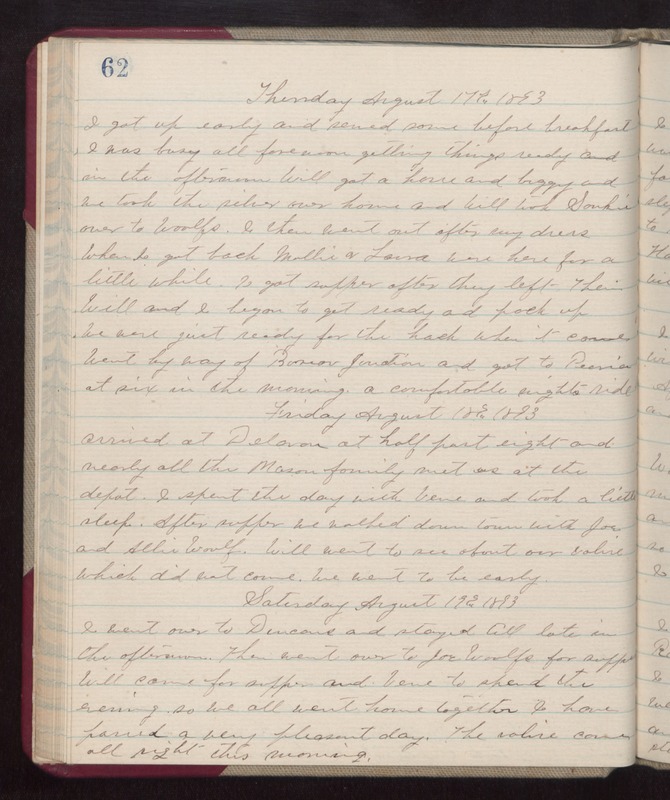 Saturday August 19th 1893 I went over to Duncans and stayed till late in the afternoon. Then went over to Joe Woolfs for supper. Will came for supper and Vene to spend the evening so we all went home together. I have passed a very pleasant day. The valise came all right this morning.